A t-shirt from the early 2007 European tour of Nine Inch Nails. The highlighted letters spelled out ‘iamtryingtobelieve’ which was found out to be a website when adding “.com” to it. 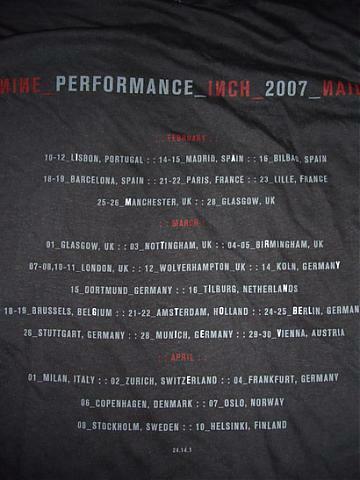 On February 12th, 2007, following the initial shows of the Nine Inch Nails 2007 European tour in Lisbon, Portugal, fans noticed a peculiarity on a tour T-shirt—several letters from the tour itinerary on the rear of the shirt were highlighted. The highlighted letters, in order, spelled out "iamtryingtobelieve," which, when adding “.com” to the end, was discovered to be an active website URL. Around the same time, the same URL was also linked to in an update on theninhotline.net. The words "I am trying to believe" are also some of the main lyrics in the song "The Good Soldier." Another reference could be found in the Year Zero trailer video that was posted on yearzero.nin.com. In the video, just before "The Presence" is seen, there is what appears to be a road sign that passes in front of the camera's view. If the video is played back in slow motion, one can see that the text on the sign is actually "I AM TRYING TO BELIEVE." The content of the website centers around a drug called Parepin. The unnamed author of the website describes a future world in which Parepin has been introduced into municipal water supplies throughout the United States, under the direction of the US government. The purported reason for this put forward in the media as excerpted on the website is that Parepin is immune system booster that will protect Americans from biological warfare; apparently in response to biological terror attacks which have occurred on the west coast. However, the website author's main thesis is that Parepin has no immune system boosting effects, and is in fact a psychoactive drug being used by the government to sedate the population and make them complacent. There also appears to be a mirror of this site set up at an alternative IP address, though DNS does not appear to link to it. Thank you for your interest. It is now clear to me that Parepin is a completely safe and effective agent developed to protect us from bio-terrorism. The Administration is acting purely in the best interests of its citizens; to suggest otherwise was irresponsible and I deeply regret it. I'm drinking the water. So should you. Attempting to reply to this auto-reply produces no further result. There have been 12 images found that are not linked in the HTML. This page was last modified on 22 May 2010, at 03:39. This page has been accessed 137,044 times.